A recent survey asked business people about the concern of hiring and maintaining employees during the current harsh economic climate. It was reported that 85 percent of respondents were concerned about recruiting employees and 81 percent said they were concerned about retaining employees. When the economy is uncertain, as in 2008-2009. turnover is rapid. Generally speaking, if an organization wants to retain its employees, it must learn why people leave their jobs and why others stay and are satisfied with their jobs. Discriminant analysis was used to determine what factors explained the differences between salespeople who left a large computer manufacturing company and those who stayed. 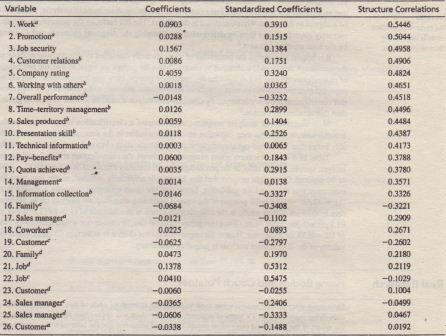 The independent variables were company rating. job security, seven job-satisfaction dimensions, four role-conflict dimensions, four role-ambiguity dimensions, and nine measures of sales performance. The dependent variable was the dichotomy between those who stayed and those who left. The canonical correlation, an index of discrimination (R = 0.4572), was significant (Wilks’ A = 0.7909, F26•173 = 1.7588, p = 0.0180). This result indicated that the variables discriminated between those who \eft and those who stayed. The results from simultaneously entering all variables in discriminant analysis are presented in the accompanying table. The rank. 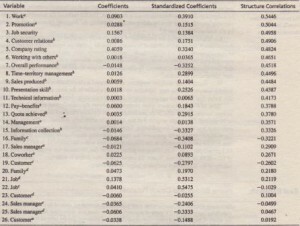 order of importance, as determined by the relative magnitude of the structure correlations, is presented in the first column. Satisfaction with the job and promotional opportunities were the two most important discriminators, followed by job security. Those who stayed in the company found the job to be more exciting, satisfying, challenging, and interesting than those who left,? Note that in this example, promotion was identified as the second most important variable based on the structure correlations. However, it is not the second most important variable based on the absolute magnitude of the standardized discriminant function coefficients. This anomaly results from multi col linearity. Many computer programs, such as SPSS, offer a leave-one-out cross-validation option. In this option, the discriminant model is reestimated as many times as there are respondents in the sample. Each reestimated model leaves out one respondent and the model is used to predict for that respondent. When a large holdout sample is not possible, this gives a sense of the robustness of the estimate using each respondent, in turn, as a holdout. It is helpful to compare the percentage of cases correctly classified by discriminant analysis to the percentage that would be obtained by chance. When the groups are equal in size, the percentage of chance classification is I divided by the number of groups. How much improvement should be expected over chance? No general guidelines are available, although some authors have suggested that classification accuracy achieved by discriminant analysis should be at least 25 percent greater than that obtained by chance.? 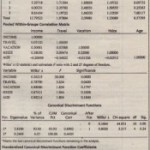 the nature of the predefined categorical groups (users and nonusers) and the interval scales used to generate individual factor scores. In multiple discriminant analysis,lf there arc G groups, G – I discriminant functions can be estimated if the number of prcdictors is larger than this quantity. In general, with G groups and k -predictors, it is possible to estimate up to the smaller of G – I or k discriminant functions. To test the null hypothesis of equal group centro ids, both the functions must be considered simultaneously. It is possible to test the means of the functions successively by first testing all means simultaneously. Then one function is excluded at a time, and the means of the remaining functions arc tested at each step. 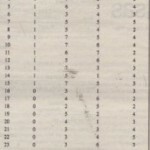 In Table 18.5, the 0 below “After Fen (after functions removed)” indicates that no functions have been removed. The value of Wilks’ A is 0.1664. This transforms to a Chi-square of 44.831, with 10 degrees of freedom, which is significant beyond the 0.05 level. Thus, the two functions together significantly discriminate among the three groups, However, when the first function is removed, the Wilks’ A associated with the second function is 0.8020, which is not significant at the 0.05 level. Therefore, the second function does not contribute significantly to group differences.